NICL Accounts Apprentices Jobs Recruitment 2018: National Insurance Corporation Limited released a recruitment advertisement inviting online application from eligible candidates for engagement to the Accounts Apprenticeship under NICL branches across India. A total of 150 vacancies are available as notified by NICL to be recruited to various Offices across the country. Candidates applying for Accounts Apprentices Jobs must not exceed the upper age of 27 years and below 21 years as reckoned on 01-11-2018. Candidates interested to join as Apprentice at NICL must have secured Bachelor of Commerce degree from a recognized University/Institution OR qualified CA-IPCC. General/OBC candidates are required to pay an application fee of Rs 600/- payable via online mode. Candidates who are interested for Apprenticeship under NICL Group will be assessed on the basis of Online Test based on syllabus as per the educational standards prescribed for the post (B.Com). Selected candidates will be appointed for a period of two-years from the date of appointment. 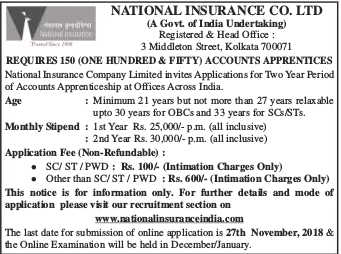 Candidates willing to undergo Apprenticeship under Accounts section through NICL must register themselves online through the official website https://nationalinsuranceindia.nic.co.in/ before the due date i.e. 27th November 2018.